I have used many different media over the years but it wasn't until I studied Painting on Silk in 1987 at the School of Visual Arts in New York City that I found my joy. I love seeing the silk paints or dyes explode on the surface of the silk. After a while the softness of the painted silks seemed to call for another texture, so I added wood that I cut and painted to match the silk pieces. I also manipulate my painted silk to create 3 dimensional art which is hardened with a special solution. Lately I discovered alcohol ink painting. The ink flows and mixes just like the silk dyes. No wonder I am attracted to this media! The ink is manipulated into shapes and designs on yupo paper or ceramic tiles. 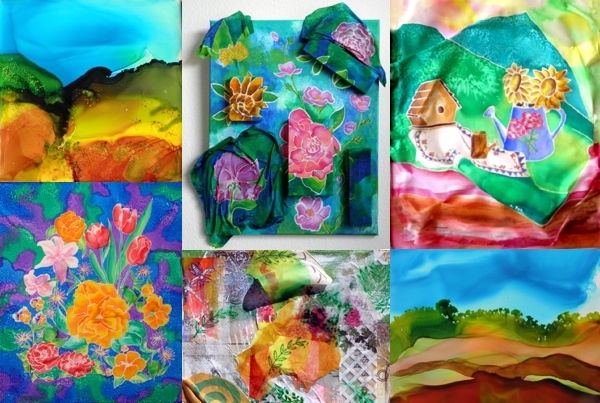 My mixed media collages and wax batik paintings are a fun departure from my very detailed silk paintings. There is quite a variety of art forms to see on this website. I taught Deaf and Hard of Hearing students for over 30 years. I hope I instilled in them a sense of creative wonder and appreciation of how the arts can enrich our lives.